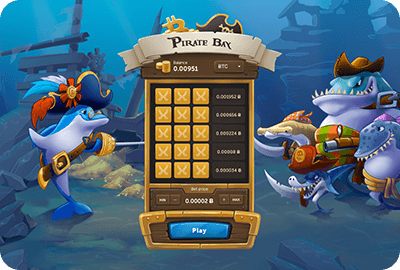 True Flip proudly presents Pirate Bay - an instant fair game, giving you a chance to win bitcoins with just a couple of clicks. Pirate Bay is based on Mersenne Twister - a fast random number generator (RNG) which forms the digital combination in the form of game symbols. When playing the game you need to guess the winning symbols one by one in order to get to the top and hit the main prize. Playing Pirate Bay is easy! 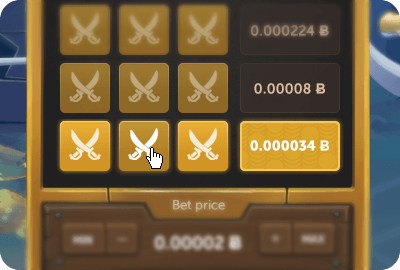 Choose the convenient way to display your betting currency at the top of the game panel. Increase or decrease your bet for up to x500 by clicking on the + or - buttons accordingly. 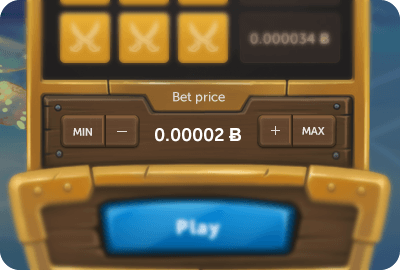 In this case, the bet price changes proportionally to the multiplier. You can check the estimate prize on the right side of the game panel. The higher the bet, the more you win! The game consists of five rows, three boxes in a row. Click Play and choose one of the boxes. Each row assumes a winning, a losing and a tie, hiding one gold coin, one black mark and one anchor. Black mark means you lost. Anchor ends the game without losing your bet. Gold coin increases your winning and gets you up to a new line. Every time you move up to a new line you can stop the game and take the prize by clicking on Take or continue playing. The higher you get, the more you win. Try your luck! 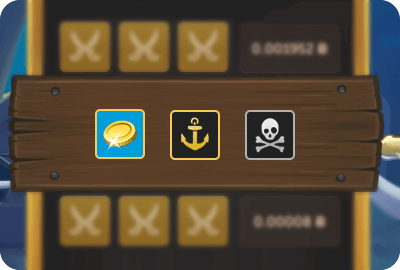 Get to the last row, find the hidden Chest of gold and the superprize is yours! Pirate Bay is based on an officially certified RNG, which can be checked by any player at any time. To do that you need to go to Check transparency page and fill out the required info. 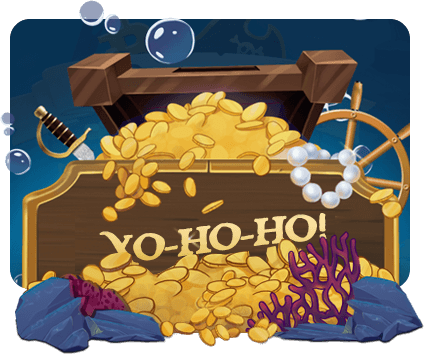 Play fair games only, where you can be 100% sure of the transparency of the results and find the pirate treasures right away! In order to start, you should make an account on our website. Following the top-up instructions refill your balance with one of the ways offered and you can start playing our games. What currencies can I pay for the tickets with in Rapid to the Moon? You can pay with Bitcoins (BTC) and TFL tokens.